Combo with Blackhowl Gun Turret? Actually, this effect stops if all your minions are at 1 health. Nah, someone tested it with Armorsmiths having like 100000000 hp, it stops at 80 bounces. "If Bouncing Blade is unable to kill any minions, due to an effect like Commanding Shout, it will stop when all minions are at 1 Health." I have a question, how this card deals with minion with immune? eg. chou and facing hunter with bestial wrath. I would run just 1. Its good to have more options other than brawl. I can see this card being played in only some control warrior decks, not all. It's very situational just like hogger and baron gedon. F.E if you had this card in your hand while you are up against hunters, how useful is it, I mean you are probably going to kill like a mad scientist or web spinner because those guys have low health anyways. You know, I think the biggest asset of Bouncing Blade is to provide a way to enable both Execute and Crush without being forced to suicide charge a minion or use up my last weapon charge. 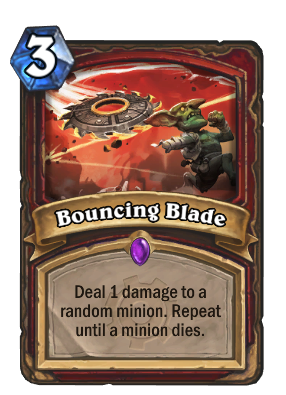 You only need to hit your target enemy minion once with the Blade to enable Execute, and even if only your minions got hurt instead of the opponent's (which I doubt will be a consistent outcome), that means that Crush can now be played for 3 mana. I don't understand why people vote down questions. A question can't be wrong. Ugh, can do some disgusting combinations with this. According to the twitter source listed underneath the card, it'll stop when all minions reach 1 health. This card can be very strong, and it may likely become a staple in warrior decks. Strong, yes. Overpowered? No. You can play around it with token minions, etc. It's a mistake to think of every card in the best/worst possible scenario when most of the time, the results of the card will be far from those outliers. All I see is a deadly shot... just a bit different, frothing is a crazy combo but there are usually answers. If you are lucky, yes. If you are unlucky he has something like a 8/5.